Games Meet Metal: NEW CHIMAIRA DVD!! NEW CHIMAIRA DVD!! 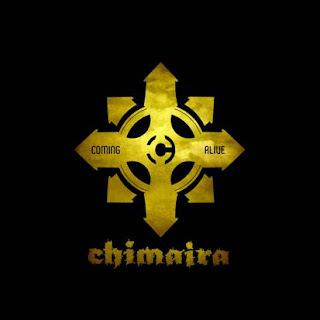 I'm a big slavering fanboy for Chimaira. Ever since I first saw them as a nu-metal band back in their early days to the metal monolith that they are today, I have always stuck with the band. For me, it's a deeper connection than just their music. I've met all the dudes in the band several times, and there's not a douchebag in the bunch. Plus, bassist Jim LaMarca is a fellow gamer, so the connection is also extremely nerdy. What I appreciate them most for is their honesty. When they released their first dvd, The Dehumanizing Process, the band decided to take a different route than what other bands would put out. That would usually be nothing but good times and lots of partying. Oh, but not Chiamira. They let you see the other side of the business: band members leaving, replacement members being erratic dickheads, lack of label support, and the band nearly breaking up. It was one of the most true portrayals of the heavy metal touring life, and is considered a must-see for any young metal band with stars in their eyes who need a dose of reality. Fast forward to today, and things have worked out for Chimaira rather nicely. A new label, their original drummer back in the fold, CD's selling, tours-a-plenty, even a few marriages and kids in the mix. Yep, it's a good time for Chimaira. They've even released a couple more doc's for their previous two albums, and those showed a much more upbeat attitude. Too bad they were rather short in length. Well, looks like Chimaira are fixing that length problem with Coming Alive, a 2 DVD/1 CD mega package of goodness. Not only do you get a 17-track live performance of great Chimaira hits on DVD and CD, but you also get a whopping 3-hour documentary covering all the touring the band did promoting their last outing, The Infection. Three fricking hours. That's a mandatory meal of a turkey and swiss on rye with mayo and a tall glass of ice tea. Might as well have something to nibble on and sip while the awesome is displayed. The whole shibang drops on July 20th. You can pre-order the sucker at the official site. Check out the trailer while you're there. That chanting crowd in the beginning just gets me all jazzed up.